This is a family favorite, full of protein and fiber from the lentils and so easy to make! 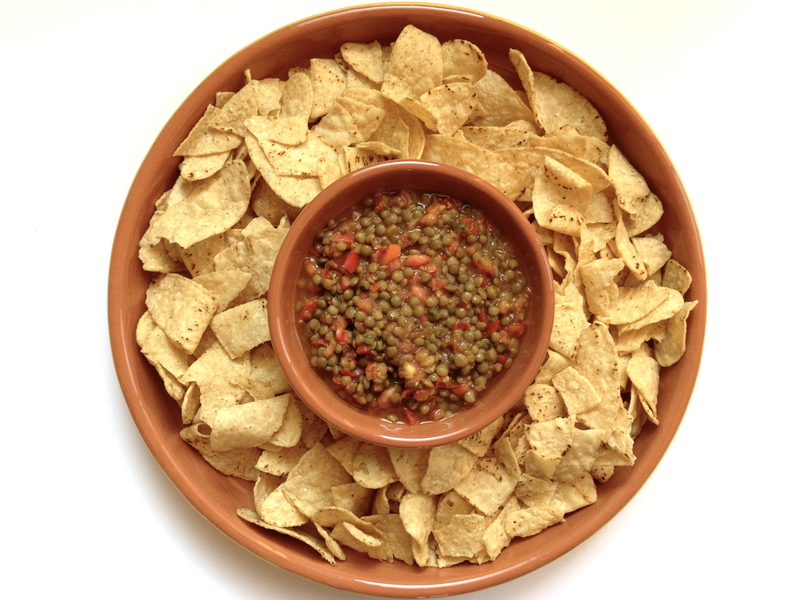 Mix the lentils and the bruschetta sauce in a bowl and serve with the tortilla chips. *I cook my own lentils using Trader Joe’s Organic Low Sodium Vegetable Broth (32 oz) and 2 cups dry green lentils. Bring the broth and the lentils to a boil over medium heat and simmer for about 45 minutes or until liquid is all gone. Add salt and pepper to taste. I use 2 1/2 cups cooked lentils for the appetizer and freeze the remainder. Hi Rena! I’ve made this before and added a little thinly sliced basil for color and fresh taste. Very yummy and healthy. Thanks Mardy. I will try it with some basil next time! Add Some Trader Joe’s Crumbled Feta And You Have Breathed Life Into A Party! Yes, you are correct, but it is delicious both ways! Thank you for the comments. I appreciate the feedback.